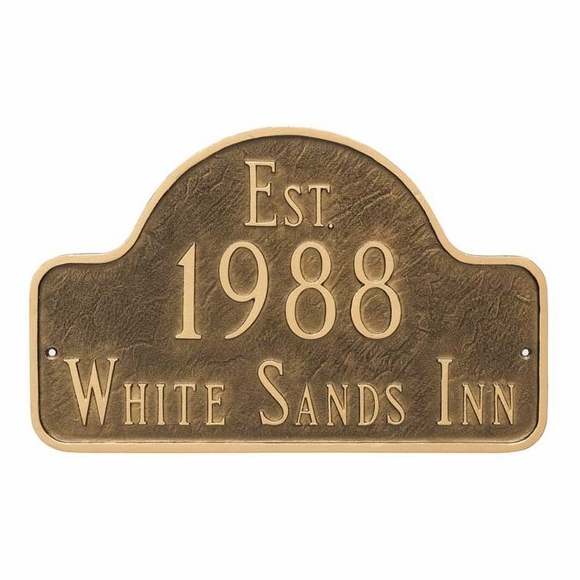 Personalized Historical Arch Marker - - for historic buildings and sites. Contains the year a building or place was founded, built, or dedicated with the word CIRCA, BUILT, or EST. on the top line. Made in USA. Note that the first letter of every word is a full-size capital letter. The rest of the word is spelled out in small capitals. Line 2 holds the year in large 3" characters. Line 3 holds the building name or address. Holds up to 17 characters (including spaces). Circa, Built, or Est. (established) historic plaque with year in 3" numbers. Solid cast aluminum construction. Characters and border are part of the sign, not added on. Comfort House exceeds all expectations in their speediness, quality of product and ease of ordering. I won't go anywhere but to Comfort House. A better price than elsewhere and a much quicker delivery than anticipated this couldn't have been an easier and more successful transaction. I'll be back! I ordered 2 historical arch markers. Both times they arrived as ordered in a timely manner. Great job, great service and would definitely order again. I love, love my plaque. It is just perfect. Very quick service for something like this - I think it was about 2/3 weeks.